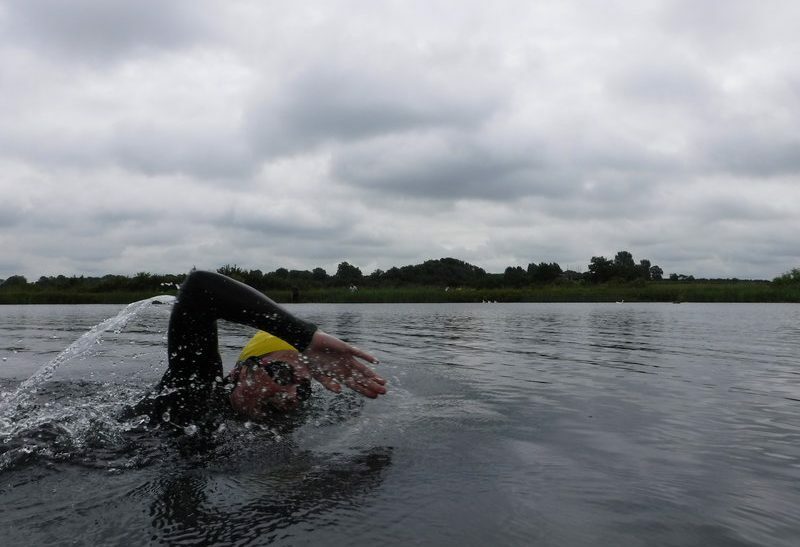 The session: 30 minutes, two laps round the lake, breaking my swim stroke down bit by bit… then putting it all back together! 1. 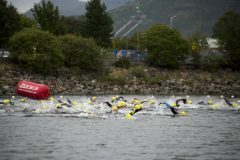 Bend Your Elbow: Swimming at Braveheart requires a 1.2 mile in a sea loch, which, Mark pointed out could mean a battle with the waves. My current style would wear me out, he explained, and not get me very far. My stroke is typical of an unconditioned swimmer. I’ve been doing crawl with my triceps and haven’t switched any of the muscles that help propel me with power, i.e. my rhomboids and my deltoids (shoulder muscles), my trapezius (muscles at the top of the back), and my latissimus dorsi (the muscles that run down the side of the back to our waists). 2. Catch and Pull: Next Mark went under the water with his camera and observed what happened once my hand entered the water. I was simply pulling down, again, not engaging the right muscles and not catching the water or adding any power to the pull back. The tweak was to flex my wrist down as I entered the water, then as I extended the arm with a bent elbow, catch, then push back nice and long. To an experienced swimmer this might seem very basic. To a novice, it was vital information that I needed to absorb. To help me get the point, Mark showed me how to do the movement on dry land by using a TRX band attached to his car and replicating the movement. Watch what I did wrong – and what I needed to do here. 3. Roll the shoulders not the body: Now I had to focus on rolling the shoulders and not my my body, whilst bending the elbow, and breaking the movement under the water into three parts, enter, bend the elbow and catch, and pull back. 4. Sculling and sighting: The next part of the session was aimed at helping to get me to improve sighting. As Mark pointed out (and as I found myself the next day, when I disengaged my brain), going off course can lose valuable time. Mark got me to look up every eight strokes. 5. 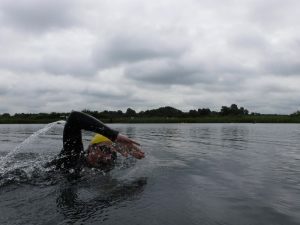 Breathing: As a runner with limited swimming hours under my belt, Mark suggested I didn’t go into oxygen debt in the swim. He recommended I breathe every two strokes. 6. The Kick: Mark showed me I had the typical runner’s kick, i.e. I bent from the knees. Watch me swim with a typical runners kick here. The result? My body was sinking down in the water. In the pool this isn’t such an issue, but as Mark pointed out, this isn’t what we want in open water – we need to be bouyant. Next, he showed me a simple drill, which you can try out when in open water: First, I treaded water with my knees bent, the bad kick. Here’s me kicking with bent knees. Next I treaded water using good kick technique, which is to kick from the hips (I imagined I was wearing fins) with the knees close together. Here’s me doing it right. 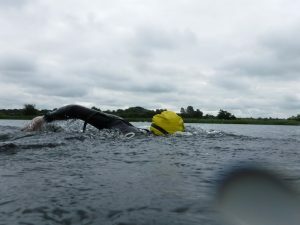 I could instantly see the difference; with knees bent, my head and shoulders were sinking into the water, with the correct kick, my shoulders rose up out of the water. Once I’d spotted the difference, Mark got me kicking from the hips upright (i.e. treading water) again, but this time, I went straight into four strokes, whilst maintaining the position. 7. Putting it all together: Armed with the previous six tips, I was off. I noticed a massive difference, mainly in how hard I was working (harder!) and my breathing (harder) – and most importantly I could tell I was faster. Mark pointed out that we absorb information in our sleep, and I knew all this wouldn’t come over night, but armed with some valuable tips, I’m more determined to practise and keep fine-tuning my swim technique. Sean McFarlane talks to entrant Dougie Vipond!